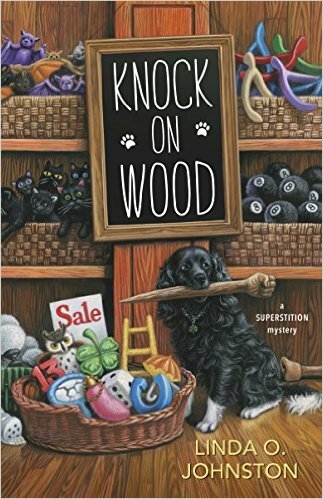 I'm here to tell you that you're going to love my latest superstition mystery... knock on wood. That means I'm knocking on wood that you enjoy KNOCK ON WOOD! 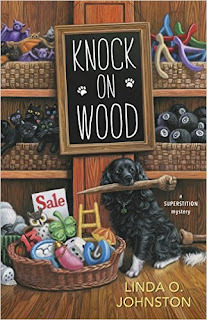 KNOCK ON WOOD is the second in my Superstition Mystery series for Midnight Ink. It's about Rory Chasen, a superstition agnostic who first came to Destiny, California, to learn if superstitions are real after her fiancé walked under a ladder--and was killed shortly thereafter. Rory stayed in Destiny after her lucky black-and-white dog Pluckie found an ill older lady in the back room of her store, the Lucky Dog Boutique. Now, Rory runs that boutique. In KNOCK ON WOOD, Rory's best friend Gemma comes for a visit and winds up staying to manage the Broken Mirror Bookstore--and run from her newly ex boyfriend. She starts flirting with others in town, and when one of them, Lou Landorf, the town's Public Affairs Director, is found dead... well, you can guess who the main suspect is. Are the superstition mysteries all about superstitions? Well, I do describe a lot of them, but I also leave it to Rory, and the readers, to determine if they're real. But my fingers are crossed now that you do enjoy KNOCK ON WOOD! Linda O. Johnston’s first published fiction appeared in Ellery Queen’s Mystery Magazine and won the Robert L. Fish Memorial Award for Best First Mystery Short Story of the year. 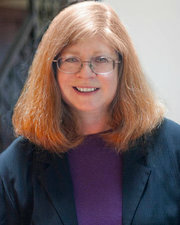 Since then, Linda, a former lawyer who is now a full-time writer, has published more short stories, novellas, and 38 romance and mystery novels, including the Pet Rescue Mystery Series, a spinoff from her Kendra Ballantyne, Pet-Sitter mysteries for Berkley Prime Crime, and Harlequin Romantic Suspense as well as the Alpha Force paranormal romance miniseries for Harlequin Nocturne. She additionally writes the Superstition Mysteries for Midnight Ink. Win a print copy of Knock on Wood. When you start a new book, do you have all the characters in place and an ending planned, or does it come to you as you write? This sounds so good - and oh, for the chance of a new life for Gemma, what an opportunity. At least it seemed that way...would love to start reading this series. Love the Cover and what a great interview. Thank you for the chance to win and read this Book. A book who needs a home? That would be my home. I would love a copy of your book.